"Hello world from comms center in (hash)Pyongyang." That Twitter missive, sent Monday from Koryolink's main service center in downtown Pyongyang using my iPhone, marked a milestone for North Korea: It was believed to be the first tweet sent from a cellphone using the country's new 3G mobile data service. Later, as we were driving through Pyongyang, I used my iPhone to snap a photo of a new roadside banner referring to North Korea's controversial Feb. 12 nuclear test while AP's Chief Asia Photographer David Guttenfelder uploaded an image to Instagram of a tour guide at a mountain temple, geotagged to Pyongyang. Pretty ordinary stuff in the world of social media, but revolutionary for North Korea, a country with intricate rules to stage manage the flow of images and information both inside and beyond its borders. Can Rodman's "basketball diplomacy" worm its way into N. Korea's heart? 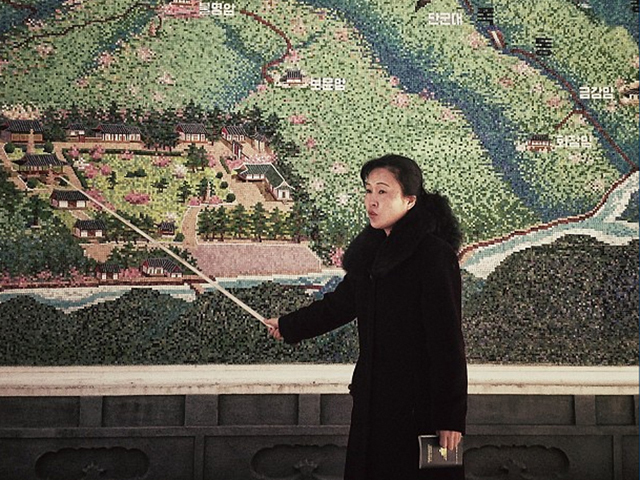 In the past, rules were strict for tourists visiting North Korea. On a bus journey across the Demilitarized Zone into the border city of Kaesong in 2008, we were told: No cellphones, no long camera lenses, no shooting photos without permission. The curtains were drawn to prevent us from looking outside as we drove through the countryside, and through the cracks we could see soldiers stationed along the road with red flags. We were warned they'd raise those flags and stop the bus for inspection if they spotted a camera pointed out the window. As we left North Korea, immigration officials went through our cameras, clicking through the photos to make sure we weren't taking home any images that were objectionable. In 2009, I did not offer up my iPhone as we went through customs. But to no avail. The eagle-eyed officer dug deep into the pocket where I'd tucked the phone away, wagged his finger and slipped the phone into a little black bag. No phone, no address book, no music: It was as though I'd left the modern world behind at Sunan airport and stepped back in time to a seemingly prehistoric analog era. Eventually, Guttenfelder and I settled into a working routine. We'd leave our cellphones at the airport but use locally purchased phones with SIM cards provided by Koryolink, the joint Egyptian-North Korean cellphone venture that established a 3G network in 2008, but without data. We brought iPod Touches and connected to the world, including Twitter, using broadband Internet that may be installed on request at our hotel, which is for international visitors. We knew in January that change was afoot. "Bring your own phone next time," a Koryolink saleswoman told me at the airport as we were departing. The next day, the longstanding rule of requiring visitors to relinquish their phones was gone. But we were waiting for the day when Koryolink would begin offering mobile Internet, and hounded the Egyptians posted to North Korea from Orascom Telecom Media and Technology for news. "Soon," they kept telling us. Last week, they called with good news: 3G mobile Internet would be available within a week  only for foreigners. All we had to do when we arrived in February was show our passports, fill out a registration form, provide our phones' IMEI numbers and pop in our Koryolink SIM cards. It's a costly luxury: SIM cards are 50 euros, or about $70, and while calls to Switzerland are an inexplicably cheap 38 euro cents a minute, calls to the U.S. cost about $8 a minute. After reporting last week on the imminent availability of 3G mobile Internet, we turned up at the Koryolink offices Monday to be among the first ones to activate the service. After paying a steep 75-euro fee and sending a text to activate the service, we waited for the 3G symbol to pop up on our phones. Moments later, I sent the inaugural tweet, which was queued up and ready to go. There was a little celebration that morning in the Koryolink office among the Egyptians who labored to set up the service and their North Korean partners. Our North Korean colleagues watched with surprise as we showed them we could surf the Internet from our phones. Koreans, North and South, love gadgets. Not all North Koreans have local cellphones. Those who do use them to call colleagues to arrange work meetings, phone and text friends to set up dinner dates and ring home to check in on their babies. They snap photos with their phones and swap MP3s. They read North Korean books and the Workers' Party newspaper, Rodong Sinmun, on their phones. But they cannot surf the "international" Internet, as they call it. The World Wide Web remains strictly off limits for most North Koreans. North Korean universities have their own fairly sophisticated Intranet system, though the material posted to it is closely vetted by authorities and hews to propaganda. Students say they can email one another, but they can't send emails outside the country. Leader Kim Jong Un has pushed science and technology as major policy directives, and we're starting to see more laptops in North Korean offices. The new Samjiyon tablet computer, made in China for the North Korean market, was sold out when I last checked at a local computer shop. Even during the days when no mobile data were available, Guttenfelder figured out a way to activate Wi-Fi sharing among his laptop, iPod touch and iPhone, and began posting geotagged pictures to Instagram. Using Loopcam, I began uploading small GIF videos that have the feel of an old-fashioned flipbook, giving movement and life to the scene on the street. These are snapshots captured as we go about our daily life working in North Korea: a man getting a haircut at a barber shop, traffic cops lacing up ice skates, a villager hauling a bundle of firewood on her back as she trudges through a snowy field. Some are quirky, unexpected things that catch our attention: a blinking Christmas tree in February, the cartoon "Madagascar" showing on state TV, a basket of baguettes at the supermarket. And some are politically telling: the empty highway from Pyongyang, people piling onto trucks for transportation, postcards showing soldiers attacking Americans, banners praising the scientists who sent a rocket into space. Despite the new construction, gadgets and consumer goods, North Korea is still grappling with grave economic hardship. It's a society governed by a web of strict rules and regulations, a nation wary of the outside world. Often, they are images, videos and details that may not make it onto the AP's products but provide a behind-the-scenes glimpse of a country largely hidden from view even in our globalized, interconnected world. They help give a sense of the feel, smell and look of the place away from the pomp of the orchestrated events shown by the state media. It is a way for us to share what we see, large and small, during our long stays in a nation off limits to most Western journalists and still largely a mystery, even to us. On Monday evening, while discussing how to cover the arrival of ex-NBA star Dennis Rodman and describing his array of tattoos and nose rings, we did what wasn't possible in the past: We Googled him from a local restaurant. Twenty-four hours later, Rodman himself appeared to be online and tweeting from North Korea. "I come in peace. I love the people of North Korea!" he wrote.